GeoSolutions has successfully implemented many GIS and related projects since it was established in 1995. The following is a brief overview of some of those projects, historic and recent. Additionally, GeoSolutions continues to provide expert DOER, road design application, training and consultancy throughout Ireland. Forest Service Northern Ireland implement mobile GIS application. Forest Service have implemented a new mobile GIS application using ESRI ArcPAD and Trimble GeoXT GPS units. The system will enable foresters to update management units in the field using up to date mapping from the FSGIS system. GeoSolutions work with University College Dublin on estate management. UCD have contracted GeoSolutions to develop and enhance the successful BuildIT system for building management within the university campus. The system is being transferred to ArcGIS 9, with intranet and enhanced reporting facilities. See more on BuildIT. GeoSolutions implement web interface for Department of Marine, Ireland. Working with Version 1 software, GeoSolutions have successfully implemented the web interface to the Department of Communications, Marine and Natural Resources in Ireland. This will give up to the minute information on sea fishery activities in Irish waters. GeoSolutions win major contract with Forest Service Northern Ireland. 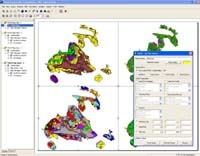 GeoSolutions have been contracted to develop a bespoke GIS system for forest management. Based on ESRI and Oracle technologies, it will bring up to date information to all 150 Forest Service staff through desktop and intranet GIS. See more on FSGIS. GeoSolutions train Northern Ireland Planning Service. GeoSolutions have developed and implemented a customised training course for Development Plan officers. Over 70 staff have so far been successfully trained in the successful use of GIS in the development plan process. GeoSolutions have continued to expand with the opening of their Belfast office. This will give enhanced levels of support to exisiting and future Northern Ireland customers. Florida National Guard implement TBMS. The US Florida National Guard has implemented 30 seats of the GeoSolutions Tactical Battlefield Management System (TBMS), currently in operational use with the Irish Defence Forces. Integrated with ITT SINCGARS radio, TBMS brings situation awareness to the relevant personnel at all times.